I've been meaning to post photos of the neck cozy I recently finished. 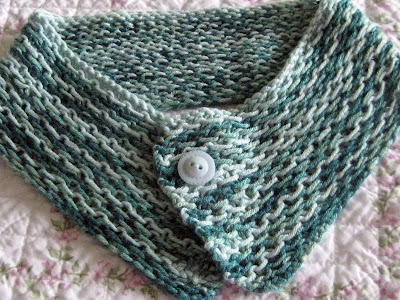 The pattern is from The Knitter's Guide to Hand Dyed and Variegated Yarn by Lorna Miser. I like that it is stretchy enough to pull over your head without having to unbutton it. The yarn is Panda Silk, a blend of bamboo, wool, and silk. I used two balls, one solid and one variegated, based on a technique I learned at the talk Lorna gave at my LYS. Works nicely as a cat cozy, too. That color is great. I agree with Rachel, Apollo needs one. You could make them smaller for cats and start a new business. 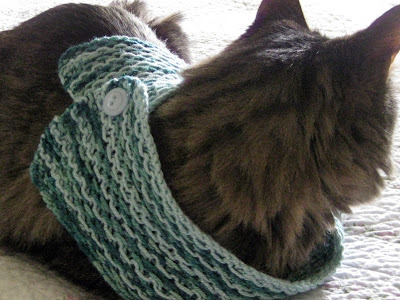 Lol, It knitted up very nice and you have to love anything that can double as a cat cozy! Beautiful and certainly looks warm around ANY neck:) Have a blessed day my friend! HUGS! It's really pretty. 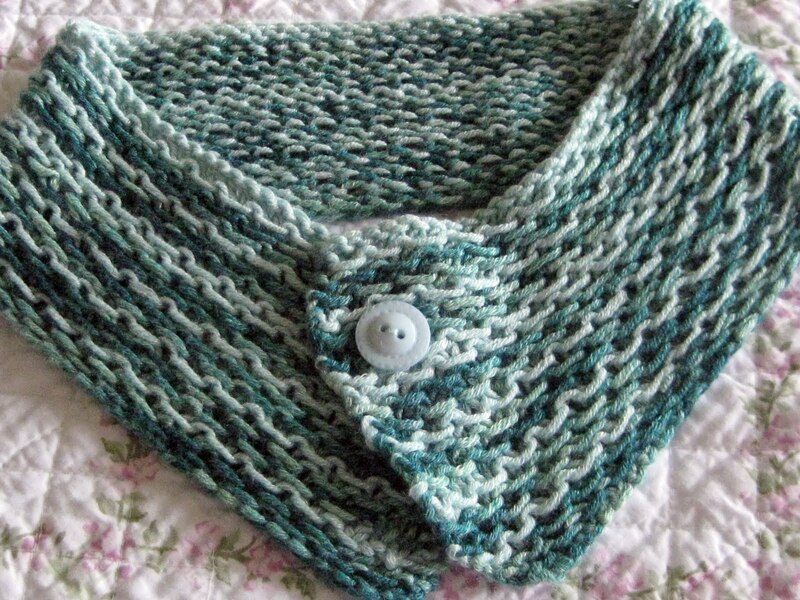 I have yet to knit a cowl and want to try. Although with our weather, I need to be under 5 wraps of wool to stay warm. I hope you're well! Cute cozy neck..you could sell LOTS of those here in MN! Haha -- that's a lucky cat! I love that neck cozy -- and we still need them here in the midwest. Very pretty! And do you really think it is possible that those came from owls? at least the neighbor kids thought so!